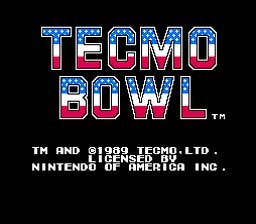 Tecmo Bowl on NES is not the first home console football game and is certainly nowhere near as realistic as today's versions, but it has to be the first fun football game in video game history. It may be the first with actual 11 man teams, but don't quote me on that. Featuring 12 NFL teams with rosters full of actual players on those teams at that time, you can play such greats as Walter Payton or Tony Dorsett. Tecmo Bowl features all of the facets of the game: running, passing and kicking. You play 4 quarters of 1:30 each, which doesn't sound like much time, but it's plenty. There are no penalties, however. Gameplay is smooth and controls respond very well. Avoiding tacklers is kind of tough, but can be done. They are faster than you in the open field, but you can dodge them when they dive at you. Passing the ball is pretty easy because your receivers always catch the ball when they are open. If they are covered by a defensive player, it almost always results in an intercepted pass for the defense. Kicking field goals is easy, too. You do not have to aim your kick, just hit the meter at full and you can make them from the 50 yard line or closer. The graphics are of the Nintendo era, of course, but if you are a fan of this game, it doesn't matter. It's very musical with various different themes for scoring, end of a quarter or at halftime, and during gameplay. Tecmo Bowl can provide hours of fun, either head to head with a friend, or in 1 player mode versus the computer. A Japanese original combined with an American original, and what a combo it was. Two teams are matched up on a playing field of 100 yards. At each end of the field are designated goals, or endzones: one side is your goal, the other is your opponent's. You try to prevent your opponent from reaching your goal and scoring. Score takes place by either: Moving the ball into the endzone (goal) for a touchdown and six points, or by kicking the ball through the goalposts for a fieldgoal and 3 points. After a touchdown has been scored, you attempt a short field goal for 1 extra point. You can also score 2 by tackling an opponent with the ball in his endzone. When you have the ball on offense, you have 4 tries or "downs" to move the ball 10 yards or more. If you succeed, you are awarded a first down and another four downs. If you fail to move the 10 yards in four downs, your opponent gets the ball and you must play defense. Usually, on fourth down, you would either punt the ball to your opponent to move him further from your endzone, or attempt a field goal if you are in range. On offense you select from 4 different plays, two running plays and two passing plays, before play begins. Each play is shown on the screen and is selected by with directional and A corresponding to a controller diagram below the play. Your team lines up and ball is put in play by pushing A. When passing the ball, A cycles through your receivers and press B to throw the ball. For running plays, press A when your team lines up and the quarterback automatically hands the ball to the running back. When playing defense, you pick a play you think your opponent is going to use. When the other team lines up, select a defender to control during that play using A. If you pick the exact same play as your opponent, your team will fiercely tackle the quarterback or running back. To kick the ball, press B when you are selecting plays. A window will pop up with the option to punt or field goal. Move the cursor over your selection and press A. When your team lines up, for either punt or field goal, press A to put the ball in play. When the ball has been snapped, a meter will appear in the corner of the screen above the kicker. Press A again when the meter gets full or near full. When running from defenders, run at an angle and alternate between up and down. This will make some defenders dive at you and miss.